The pilgrimage to Fordham was in preparation for a seven-day pilgrimage to the little town in the French Pyrenees where the Virgin Mary appeared to the 14-year-old Bernadette Soubirous in 1858. Two years ago, a friend who is a member of the Order of Malta began encouraging me to join the knights and dames on their annual trip to Lourdes. 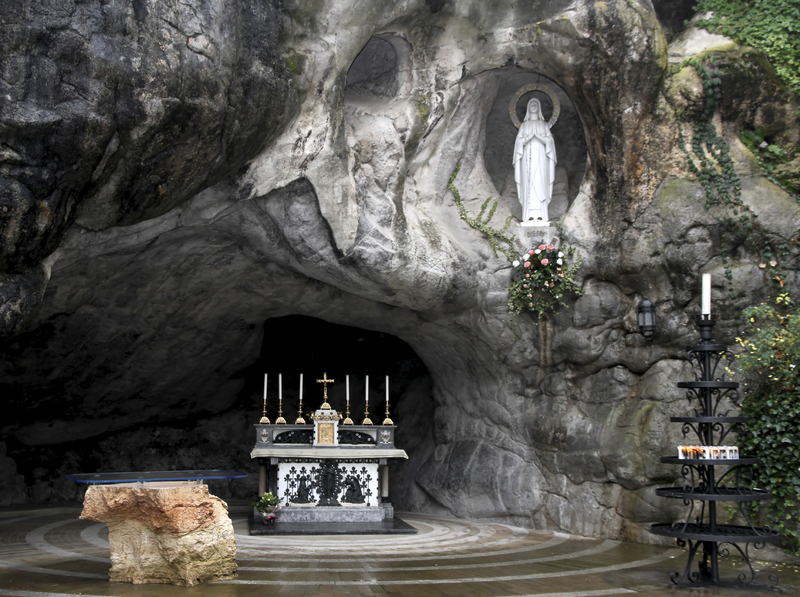 And though I have a great devotion to St. Bernadette and had just read Ruth Harris’s excellent study, Lourdes: Body and Spirit in a Secular Age, I turned down his kind invitation. Too busy, I said. Finding companions was easy. Two friends, Brian, a priest who works at a retreat house, and George, who would be ordained a month after our trip, signed on immediately. The Order of Malta has asked us to meet them at Baltimore-Washington Airport three hours before our 7:00 p.m. charter flight, which will fly directly to Tarbes airport, a few kilometers away from Lourdes. We are greeted by a sea of people, mostly middle-aged or elderly, some wearing silver medals dangling from red ribbons denoting the number of pilgrimages they have made. Scattered in the crowd are men and women in wheelchairs or looking painfully thin. Other couples cradle children obviously suffering from either illness or birth defects. These are, as I already know from Ruth Harris’s book, the malades, the sick, the main reason for the journey. Their trips have been paid for by the order—a wonderful act of charity. Everyone, including the malades, boards the plane cheerfully. The flight begins unlike any I’ve been on, with a bishop leading us in the Rosary. The in-flight movie, not surprisingly, is “The Song of Bernadette,” which I had not seen for many years. It corresponds reasonably well to the original story of the apparitions at Lourdes, though it stints on the natural toughness of Bernadette Soubirous. In Lourdes, Ruth Harris points out that Bernadette assiduously turned down pleas to imitate the physical actions of the Virgin (like making the Sign of the Cross) and, more famously, refused to accept gifts, despite her appalling poverty. Far from compromising her image, such toughness makes her in reality a more convincing saint than does the film’s portrayal. We land after a long flight, a sleepless one for me. The bus ride from the airport, through a rainy countryside studded with tall poplars, is full of lively conversation, and we quickly arrive at our lodgings, the Hotel Saint-Sauveur. It looks as if all the hotels and shops at Lourdes boast religious names, and it is startling to see a shop selling tacky souvenirs named after Charles de Foucauld, who lived in extreme poverty in the desert or, worse, a knickknack shop huddled under a sign that reads “L’Immaculée Conception.” After lunch our group (perhaps 250 of us) processes to Mass in what will become our usual formation: the malades, seated in small hand-pulled carts, are in front, accompanied by companions, followed by the rest of us. A letter we received prior to departure said: “Your cassock can be worn anywhere at anytime. It will be useful for the Mass in the Grotto...and of course during all the processions....” Rather than risk giving offense, Brian, George and I have scrounged up some Jesuit cassocks, and we decide to wear them today. Far from an embarrassment, as I had expected, the black cassock somehow feels right in Lourdes. As we cross the square in front of the basilica, I notice brown-robed Franciscans, white-robed Dominicans and even a black-and-white Trappist. While the plain Roman collar makes me feel priestly, the cassock helps me to feel very Jesuit. The area before the Grotto is marked off by signs requesting silence, and as I approach I am drawn to the obvious peace: serenity seems to radiate from Massabieille. Hundreds of people are gathered before the space—malades in their blue carts, a Polish priest with a group of pilgrims praying the Rosary and a young backpacker in jeans kneeling on the ground. Many stand in line to walk through the Grotto. Joining them, I run my hand over the smooth wet rock and am astonished to spy the spring uncovered by Bernadette. I am filled with wonder at being here. As I pass beneath the Virgin’s statue, I notice a host of tiny flowering plants of marvelous variety under her feet, and think of medieval tapestries. As the first Ave Maria is sung out over the square, tens of thousands of pilgrims lift their orange-flamed candles in unison, and I am overcome by this profession of faith: malades and the able-bodied, of all ages, from across the world. It seems a vision of what the world could be. By now Brian, George and I have met many members of the Order of Malta, as well as many of the malades. The term here is not pejorative. “We’re all malades in one way or another,” says a bishop on pilgrimage with us. The range of illnesses they live with is stunning: cancer, AIDS, Lyme disease, dementia, birth defects. At lunch, I sit with a couple from Philadelphia. The woman suffers from a disease I have never heard of, which has left her, in her late 30’s, unable to walk easily and prone to a host of painful physical ailments. She and her husband are aware of the seriousness of her condition, but they are consistently friendly, happy and solicitous, and I like them immediately. “Oh, I’m fine,” she says. “I’ve been laughing since I got here. So many funny things have happened!” As we process to Mass, Brian and George quietly describe the conditions faced by other malades they have met. Lourdes, of course, is famous for its healing waters, though nothing in the words of Mary to St. Bernadette suggest this. (She merely said, “Go drink of the spring and bathe yourself there.”) The short paperback guide we receive wisely counsels against expecting physical healings. As we would discover, spiritual healing is the more common outcome for pilgrims. But I pray for actual physical healing for the malades anyway, especially the ones I know, here and at home. Tonight’s Rosary procession is as moving as last night’s, if this is possible. Somehow, in the midst of this huge crowd, Brian, George and I are spotted by one of the officials of the Domaine, that is, the sprawling area surrounding the Grotto and the basilica. “Vous êtes prêtres?” he asks. “Are you priests?” When I nod, he pulls us through the crowd to the steps of the basilica. There we join other priests who gaze out at the enormous throng, just then raising their voices in the “Lourdes Hymn” in the damp night air. Just wanted to express my extreme pleasure about this article. I don't often read articles about our Blessed Mary and the message she brought to us through Bernadette at Lourdes. This article is superb in its description of the events and the surrounding. I felt like I was there enjoying this pilgrimage with them. Many thanks for the wonderful two-part Faith in Focus article by James Martin, S.J., on his experiences at Lourdes. While reading of the faith experiences of other pilgrims was inspiring, I especially appreciated reading Father Martin’s honest reflections on his own spiritual journey. He made a somewhat reluctant visit to Lourdes, only to find that un-nameable, intuitive “something” that stayed with him, and his experience blossomed into the prayerful and engaging song of hope published here (8/2, 8/16). His story reminds me of a young woman we know about who also made a journey and upon recognizing that intuitive “something,” leapt into her own song of hope and triumph: “My soul does glorify the Lord, my being rejoices in God my savior, for he has looked with favor on his lowly servant.” Father Martin has reminded us, quietly and powerfully, that God still looks with favor on his lowly servants, that we still call the young woman blessed, and that Holy is his name. Thanks for the refreshing journey. This article also appeared in print, under the headline "Lourdes Diary," in the August 2, 2004 issue. James Martin, S.J., is an associate editor of America and editor of Awake My Soul: Contemporary Catholics on Traditional Devotions.